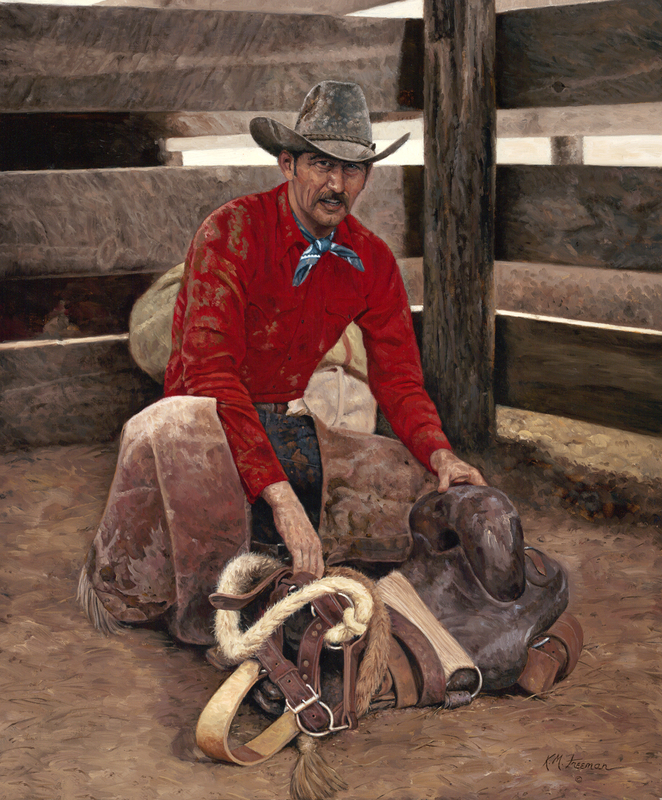 Scottsdale, AZ – Four important master works by western artist Kenneth M. Freeman (1935-2008) will be showcased in the inaugural exhibit Collecting the West: Ranching, Rodeo, and Roughstock at the Desert Caballeros Western Museum in Wickenburg, Arizona. 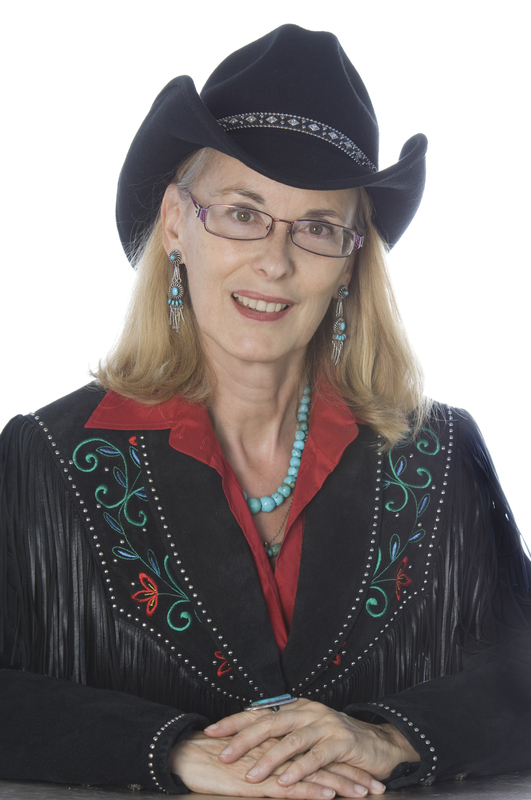 For artist Kenneth M. Freeman, the cowboy hat and boots was not a gimmick or shtick. Neither was his Arizona attitude. Ken Freeman may have grown up in a traditional Jewish home in Chicago, Illinois but make no mistake … he was a cowboy. Freeman spent the last 20 years of his illustrious career in Scottsdale, Arizona. 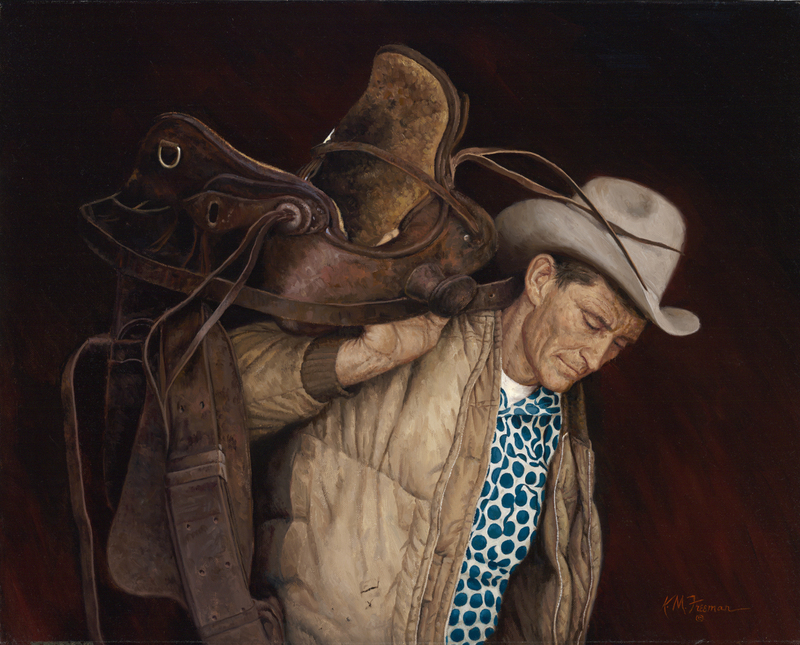 The Freeman artwork depicts the theme of the Collecting the West exhibition which showcases outstanding works of art as well and historical objects while weaving together rich stories relating to ranching, rodeo and the animals that are part of western traditions. The exhibit opens to the public on October 23, 2010. “Ken’s old masters’ technique was very time consuming but the outcome is extraordinary. It is the only way to achieve the depth of colors and warm layers of content that will pass the test of time. 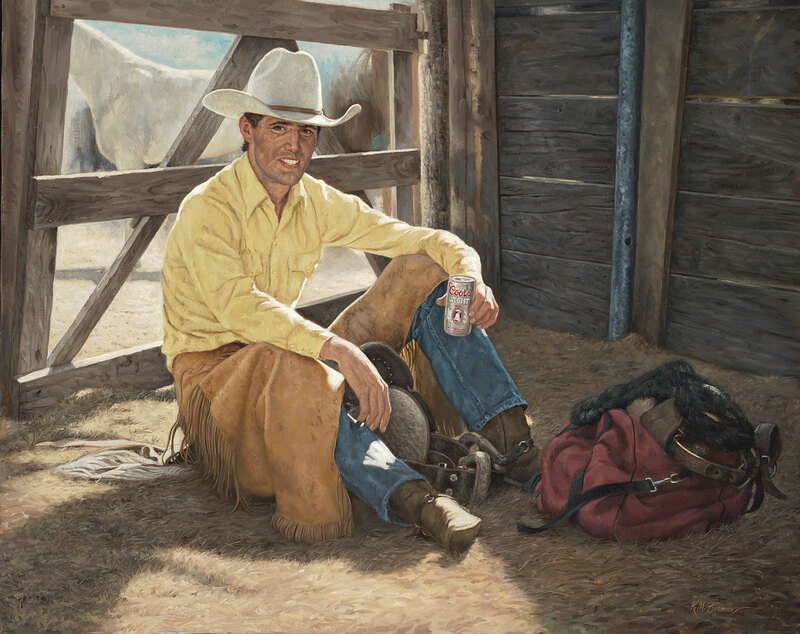 This painting technique will last for hundreds of years,” said Edward Holmes, president of Western Artists of America whose organization presented Freeman with a Lifetime Achievement Award, hereafter named the Freeman Lifetime Achievement Award. Freeman’s artwork for the Collecting the West exhibit recently were part of the Kenneth M. Freeman Legacy: Artist at Work that was exhibited earlier this year at the Smithsonian affiliate Booth Western Art Museum in Cartersville, Georgia. The pieces for the Desert Caballeros Western Museum include Tough Draw, Winning Combination, After the Ride and Hard Day’s Night. Tough Draw is the lead painting for Artist at Work and features a rodeo cowboy realizing the consequences of his next ride … a tough draw. The Desert Caballeros Western Museum presents its inaugural Collecting the West exhibition organized around a theme, which will differ each year, with distinctive highlights from private and public collections throughout the Southwest. Collecting the West: Ranching, Rodeo, Roughstock features artwork by some of the most recognizable names in Western art, including Frederic Remington, Kenneth M. Freeman, J.W. Hampton, Will James, George Phippen, Ed Mell, Bill Owen, Billy Schenck, Gary Ernest Smith and John Coleman. Also featured in the show are photographs by Earle Forrest, Scott Baxter, Mark Gilliland and Jodie Sinclair. Collecting the West: Ranching, Rodeo, Roughstock will be on view through February 6, 2011 at the Desert Caballeros Western Museum in Wickenburg, AZ. Works of Kenneth M. Freeman are in the permanent collection of the Smithsonian Museum, Library of Congress, American Art Academy, and Booth Museum as well as distinguished private collections. 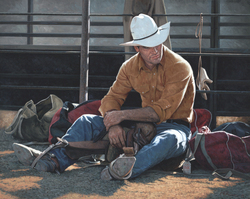 Accolades include winning competitions at the San Diego Museum of Art, the Hubbard Museum of Art, the Illinois State Fair, the Salmagundi Show in New York City, the Union League Club of Chicago, being chosen five times as artist for the Parada Del Sol Rodeo in Scottsdale, AZ and having a painting selected for the 1988 Prescott Centennial Rodeo. He was an illustrator for authors like Louis L’Amour. The Desert Caballeros Western Museum is an accredited museum by the American Association of Museums and is known as Arizona’s Most Western Museum. Serving over 55,000 visitors a year, the Museum preserves and exhibits the art and history of the Southwest and the desert frontier, and is well-known for its innovative exhibitions and programming. Each spring, the Museum hosts the internationally acclaimed Cowgirl Up! Art from the Other Half of the West exhibition and sale. The Museum features an extraordinary collection of western fine art, American Indian art, along with the Hays’ Spirit of the Cowboy Collection, which is one of the most comprehensive collections of western artifacts, memorabilia and trappings on display in the country. The Museum’s entire lower level is devoted to a re-creation of life in Late Territorial Wickenburg including a fascinating permanent exhibit geared for children called Out on the Ranch. For more information, call 928-684-2272 or visit http://www.westernmuseum.org .